It's Friday, and that means another Vermonters First mailing has hit your doorstep. Like clockwork, the conservative super PAC has been firing off direct mail pieces targeting legislative races each Friday for the past three weeks. 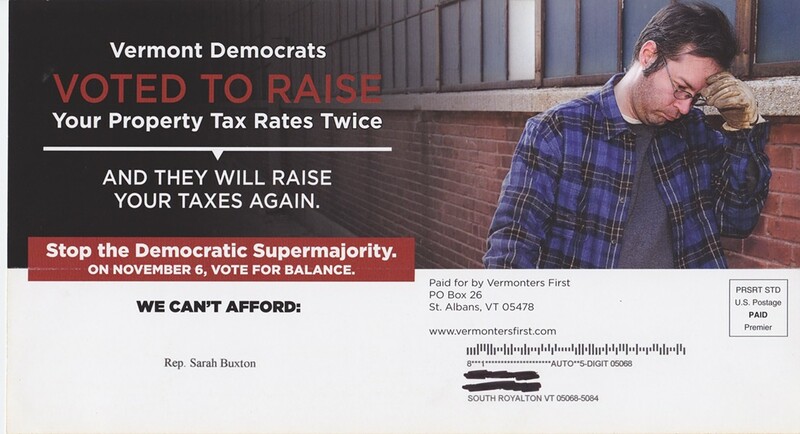 For the first time, this week's mailer names the Democratic and Progressive legislators it hopes voters will reject. 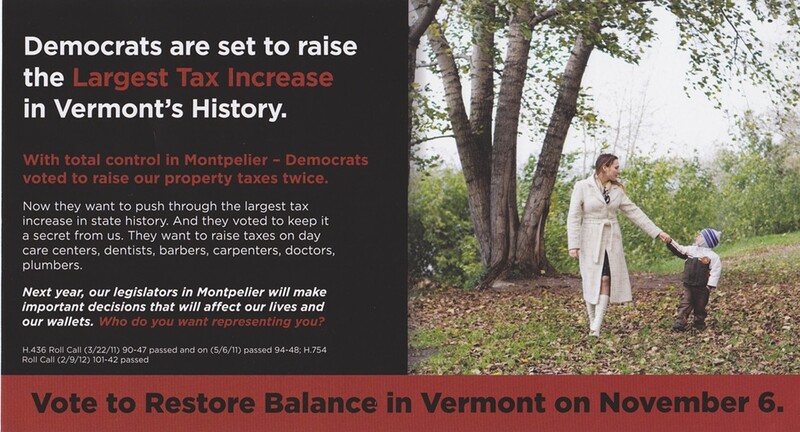 "Vermont Democrats VOTED TO RAISE Your Property Tax Rates Twice. AND THEY WILL RAISE YOUR TAXES AGAIN," one side of the mailer screams. "Stop the Democratic Supermajority." 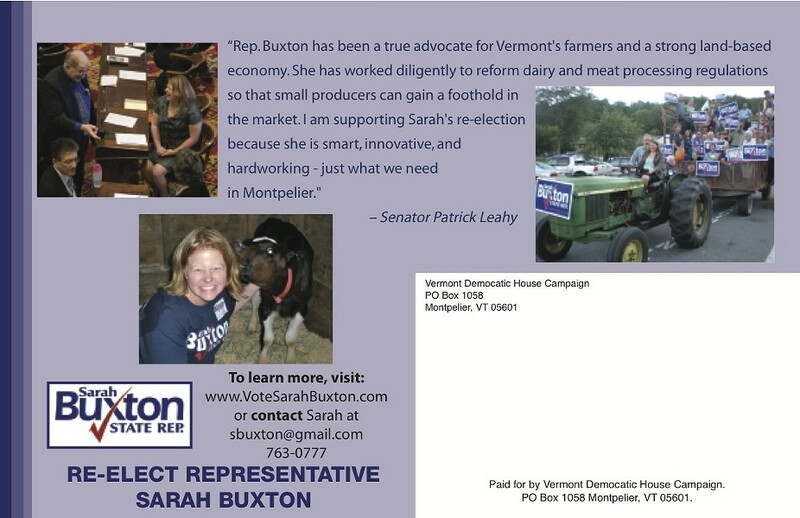 In true fill-in-the-blank style, the version we saw (pictured below) tells us, "WE CAN'T AFFORD: Rep. Sarah Buxton." 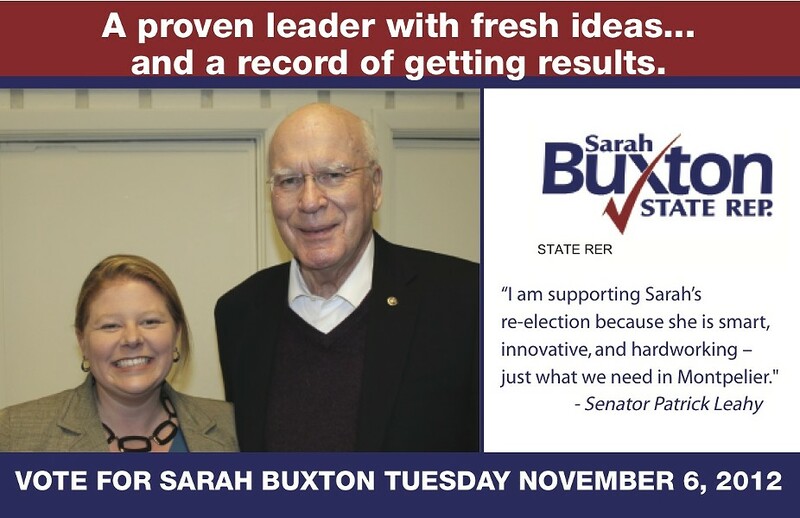 A recent mass media report posted to the Secretary of State's web site makes clear that Buxton, a Tunbridge Democrat, isn't the only Dem targeted in the mailing. That filing, which pegs the cost of the piece at $39,330, lists 38 Democratic and Progressive legislators as targets. "The woman in the picture is wearing white boots outside," Buxton says. "I don't know of a single Vermont woman who even owns white boots — let alone wears them outside." 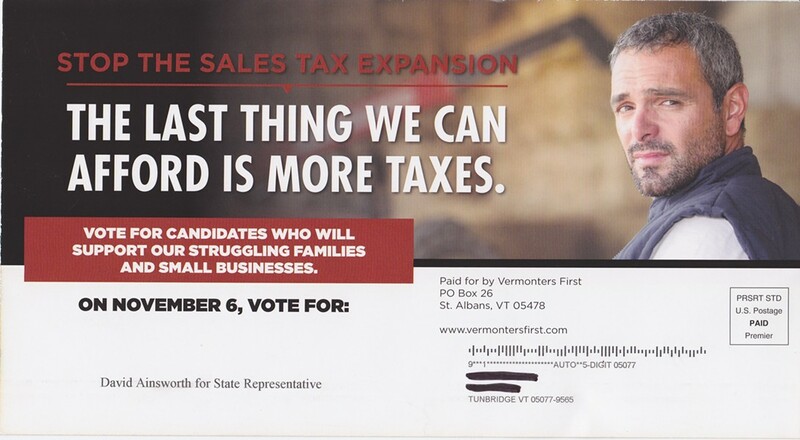 While plenty of attention has been paid to the television ad campaign waged by Vermonters First, less has focused on its direct mail efforts. Before this latest piece hit the streets, the group had spent $202,000 on mail, according to a campaign finance report filed Monday. Last week's mailer focused on the Democrats' alleged efforts to expand the sales tax to service-based industries — a claim that doesn't totally check out, as we wrote here. That mailing appeared to cost the super $39,330 as well. 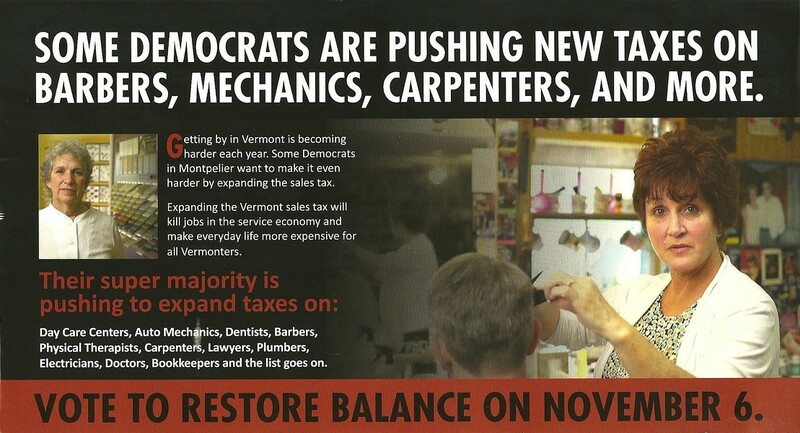 You can check out Vermonters First's original legislature-focused mailing here. That piece, which was sent two weeks ago, also included an absentee ballot request form. That somewhat more elaborate mailer appears to have cost twice as much: $66,930. Tayt Brooks, the super PAC's treasurer and consultant, did not respond to an attempt to reach him Friday. Nick Charyk, who runs the House Democratic majority's political arm, says that while his outfit plans to send mail in support of its candidates, it does not plan to rely on a cookie-cutter approach. "This is not how we want to spend our money," he says. "Any mail we do will be positive for our candidates and district-specific."